Thank you for joining us in celebrating innovation in education. Click here for highlights and pics from the event. An engaging conversation on the topic “Diversity, Technology, and The Future of Education” followed by a cocktail reception to celebrated the launch of XYP: ExpandED Young Professionals Network. You’re invited to become a member of XYP today. Send a Note to Welcome a 6th Grader to Middle School! If you could go back in time, what would you say to your adolescent self? Now you can impart words of wisdom and encouragement to a 6th grader in one of our schools. Simply fill in the blanks of a prewritten letter and click submit. A student will receive your note and a pencil. Send your note! Over 30 young NYC professionals joined us for a happy hour with the ExpandED Schools Junior Board to learn about our mission to close the learning gap. Thank you for joining us in celebrating our reaching 1 million students this school year! Click here for highlights and pics from the event. Thank you to Team ExpandED for running to close the learning gap! Thank you to everyone who sent a note of encouragement to a 6th grader in the Bronx, welcoming them to middle school! On May 5, 2016, we held our spring benefit at the Hippodrome in New York City to support our mission to increase education and enrichment opportunities for kids who need it the most. Emceed by Soledad O'Brien of Starfish Media Group and member of the Board of Directors at ExpandED Schools, the event honored Ramón González (principal of The Laboratory School of Finance and Technology X223), Danny Meyer (CEO of Union Square Hospitality Group) and Merryl Tisch (Chancellor Emeritus, New York State Board of Regents). Attendees enjoyed breakdancing and step dance performances by ExpandED kids, wrote about education experiences on the Reflection Wall, bid on items in our silent auction, and met students and educators in our expanded learning showcase. Click here to view event pics. Meet the five runners of 2016's Team ExpandED Schools here. See how we celebrated the #ExpandEDyear! Hosted by the ExpandED Schools Junior Board at YouTube Space NY, this salon was a two-part discussion with ExpandED Schools Board Chair and Starfish Media CEO Soledad O'Brien about increasing access to enriched education experiences and closing the learning gap for kids in underserved communities. Soledad was joined by panelists New York Times best-selling author Dale Russakoff, YouTube Creator Kevin Lieber of Vsauce2 and EducationNews.org's Editor-in-Chief Matthew Tabor. Click here to view highlight videos. Click here to view event slideshow. On May 27, 2015, we held our spring benefit at the Hippodrome in New York City to support our mission to increase education and enrichment opportunities for kids who need it the most. 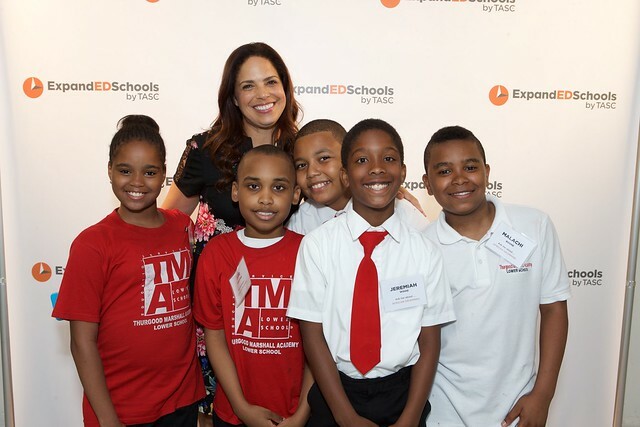 Emceed by Soledad O'Brien of Starfish Media Group and Chair of the Board of Directors at ExpandED Schools, the event honored Roger Ferguson (TIAA-CREF), Christina Fuentes (NYC Department of Education) and Herb Sturz (Open Society Foundations) for their commitment to closing the learning gap. Click here to view event pics.